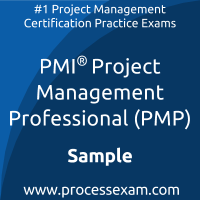 You have to pass the PMP exam to receive the certification from PMI. To increase the effectiveness of your study and make you familiar with the actual exam pattern, we have prepared this sample questions. Our Sample Project Management Professional Practice Exam will give you more insight about both the type and the difficulty level of the questions on the PMI PMP exam. However, we are strongly recommending practice with our Premium PMI Project Management Professional (PMP) Practice Exam to achieve the best score in your actual PMI PMP Exam. The premium practice exam questions are more comprehensive, exam oriented, scenario-based and exact match of Project Management Professional exam questions. 01. What are the inputs to the Develop Project Charter process? 02. You are performing the Manage Quality process and establishing expected values for the dependent relationships in the hierarchy. Which technique are you using? 3) You are the project manager for the JHN Project. Mike, a project manager you are mentoring, does not know which plan he should reference for guarding the project scope. Which plan does Mike need? 04. Why should a project team complete lessons learned documentation? 05. If your expected value is 110 and the standard deviation is 12, which of the following is true? a) There is approximately a 99 percent chance of completing this activity in 86 to 134 days. b) There is approximately a 68 percent chance of completing this activity in 98 to 122 days. c) There is approximately a 95 percent chance of completing this activity in 98 to 122 days. d) There is approximately a 75 percent chance of completing this activity in 86 to 134 days. 06. You need to communicate information in a multidirectional fashion with several stakeholders. Which of the following is true? a) This describes push communication, which is a communication model. b) This describes interactive communication, which is a communication method. c) This describes communication requirements analysis, which is a communication model. d) This describes pull communication, which is a communication method. 07. Which of the following best characterizes Six Sigma? 08. The amount of authority a project manager possesses can be related to all of the following except which one? 09. A negative result from an SV calculation means which of the following? a) PV is higher than EV. c) EV is higher than PV. d) EV is higher than AC. 10. Once you earn the PMP, the certification is valid for how long?